I have recently installed a new hard drive to my Ubuntu 10.0.4 box. I used System -> Administration -> Disk Utils to format the disk (ext4 file type) - but did not create a partition (is this advisable?). I have manually mounted the drive as /mydata. I want to have the machine automatically mount the device on startup/reboot. How may I do this? First of all your /dev/sdb isn't partitioned. I am assuming this is the disk you want to mount. Be careful with this file as it can quite easily cause your system not to boot. Add a line for the drive, the format would look like this. Then on the next reboot it will auto mount. Note: Make sure to replace the X with the right value for your situation. Or you can use Storage Device Manager, from the software centre. noatime and nodiratime are some optimizations. If you want you can remove them. For FAT32 replace ntfs-3g with vfat. You could do it via /etc/fstab. 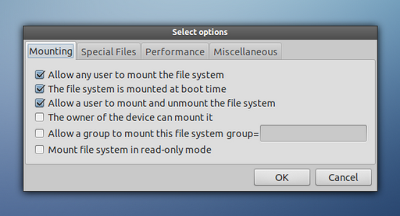 It means that the device/partition located at /dev/hda2 will be mounted to /myfiles using the file system ext2, with default mount options and no dumping and no error-checking enabled. The fstab file lets the system know which drives to mount (or how to mount them, at least). /dev/sdb1 should be the device and partition for the disk you want to mount. /mydata is the place where you want to mount it. The other values (defaults 0 0) are OK like I show them. If you want to learn more, you can read man fstab. fstab will help you for sure. 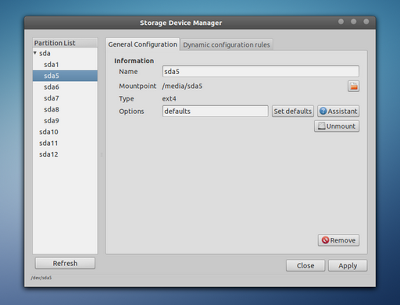 For those lazy and cautious ones who want to use a simple and self-explanatory GUI there is a tool called Storage Device Manager (pysdm). The tutorial here will do basically the same as other answers in this thread suggest to do, but the tool will accomplish it with a couple of clicks and no need to enter configurations manually into fstab config file. Reboot and see that your drive gets automatically mounted now. You can learn more about assistant settings from this article, as it explains the process in details and my answer is based on it. UPDATE: pysdm has been removed from the Ubuntu archives (AskUbuntu page), sudo apt-get install pysdm does not work anymore. Avoid using pysdm for now. 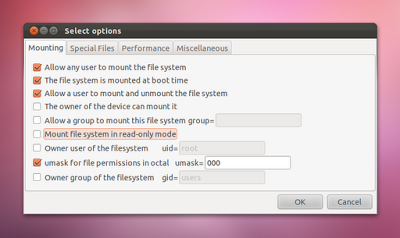 please remove Pysdm from Ubuntu repositories. It is obsolete (not updated since June 2006 !! ), buggy (https://bugs.launchpad.net/ubuntu/+source/pysdm) , doesn't handle UUIDs (which is now fstab standard in all supported Ubuntu versions !!!) and it has already been removed from Debian repositories. If you do not want to partition or cannot afford to, you can use udisks to mount or unmount devices or disks. The UUID method is the most stable one as other ID methods can change if you rename your label for example. It will in fact do the same as you would do by clicking the device on nautilus. Just add it as a "startup application" to preform at login. Will do the same as clicking the unmount arrow in nautilus. 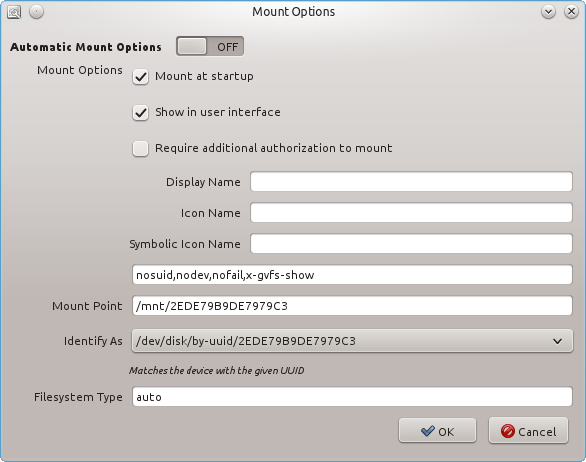 One disadvantage over the fstab method is the device will be mounted in /media/disk_label with no option to choose another mount-point. One advantage is you do not need root access to mount or unmount the drive. Different locations for MySQL databases? Where is the “pysdm” package? “mount -a” not called at startup? How to assign a UUID to a hard drive?